A friend challenged me to build on my initial foray into Netflix Origami by folding models related to the movie I had just watched. The next movie turned out to be MirrorMask. I found the movie to be a visually delightful fantasy, with elements reminiscent of Labyrinth, Alice in Wonderland, and the Neverending Story. The Jim Henson company was a major part of the movie-making effort, and much of the puppetry speaks to that, albeit with a darker, Neil-Gaiman-inspired flavor. The plot isn’t terribly complex, but I loved the experience of watching the movie. But enough about the movie — what about the origami? I found instructions for making a Guy Fawkes Mask that seemed like it would fit the bill. The instructions are extremely sparse and rely on cryptic hand-drawn diagrams as well as assuming that you have a good familiarity with terms like “squash fold” and “crimp fold”. I’m not sure I would have made it through without relying on the eminently more useful video 1 and video 2. 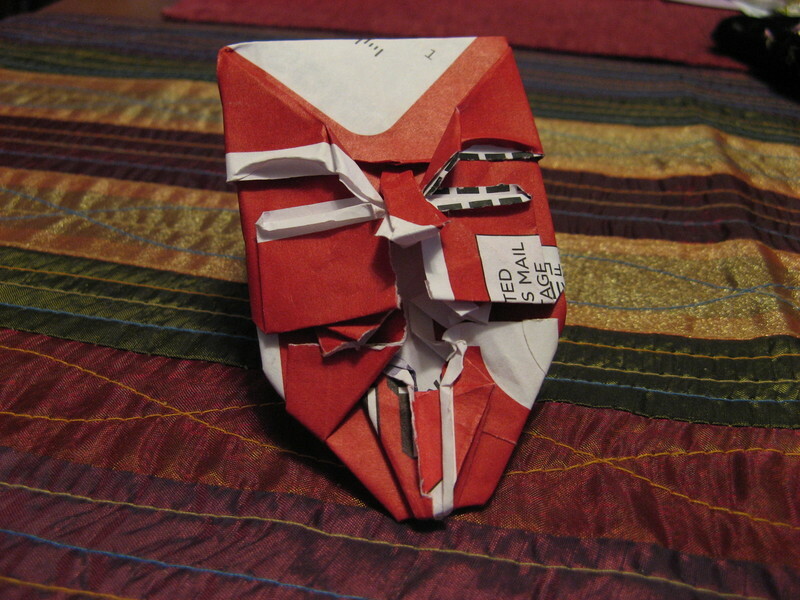 But combined together I was able to produce, well, something that almost looks like a mask!